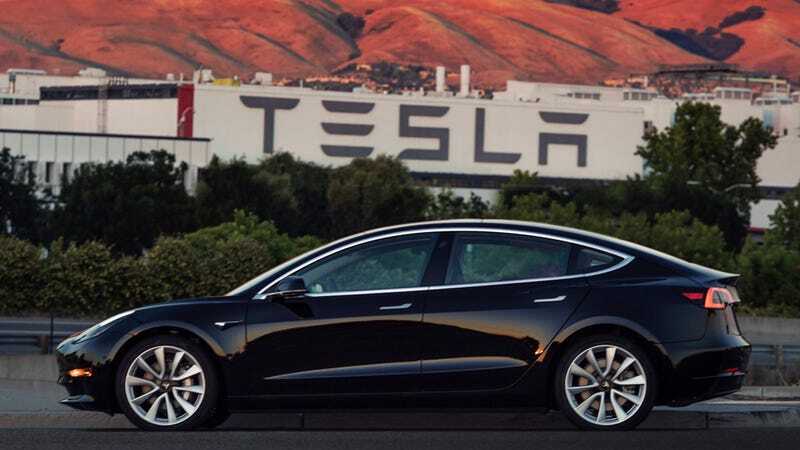 After teasing his Twitter followers earlier this evening, Tesla CEO Elon Musk delivered the first look at what he says is the first production model of the the Tesla Model 3. 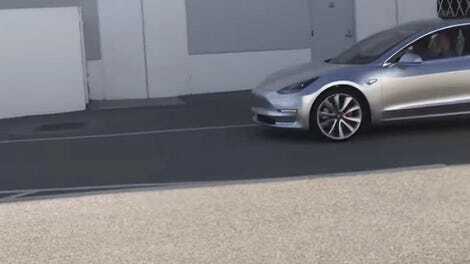 Musk has yet to deliver any further detail, but looking back on the concept revealed early last year, not much seems to have been altered in the Model 3's appearance. We do know that Musk has previously claimed that there will be an official “handover party” for 30 customers on July 28, followed by around 100 Model 3 deliveries in August, and around 1,500 more deliveries in September, with an eye on reaching 20,000 deliveries of the car “per month” starting in December. Tesla has not updated information on the number of current Model 3 reservations, but the last figure made available was around 370,000. With such high demand, options on early orders will be limited to just about wheel and paint color specification, and new Model 3 orders aren’t expected to be delivered until 2018 or later. The target price announced last year for the lowest Model 3 trim was $35,000, and it not yet clear how expensive the car can be optioned nor what specific features and trims will be made available to existing and future orders. Tesla has confirmed that every Model 3 will get at least 215 miles of range with performance pegged at a zero to 60 time of 5.6 seconds. Oh, and there’s Tesla’s constantly-improving semi-autonomous hardware, but you will have to pay to use it as an option upon ordering, or pay to install it via an update later if you change your mind. Tesla has claimed its new hardware, which will be installed on all Teslas going forward, should be capable of Level 5 autonomous driving by the end of this year. Also noteworthy is Tesla’s pull-back on its previously-free access to its national (and international) Supercharger network. Vehicles ordered after January 1, 2017 will receive 400 kWh of charging credit, which is approximately 1,000 miles of driving. At the time, it was previewed that charging pricing would fluctuate. Of course one of the most teased and curious elements of the Model 3 is its simplistic and possibly even sparse interior design, with Musk confirming that there would be no traditional speedometer, but that buyers “won’t care.” The concept model revealed featured a large, landscape-oriented touchscreen in the center of the dashboard. It will be interesting to see how, exactly, Tesla has made that work in the production car. Considering Tesla’s past of delaying new models, it’s a tremendous achievement for the Model 3 to reach production on schedule, as promised. Here’s hoping the thing is really the revolutionary electric car for the masses, or whatever. This post will be updated as or if more information is made available.